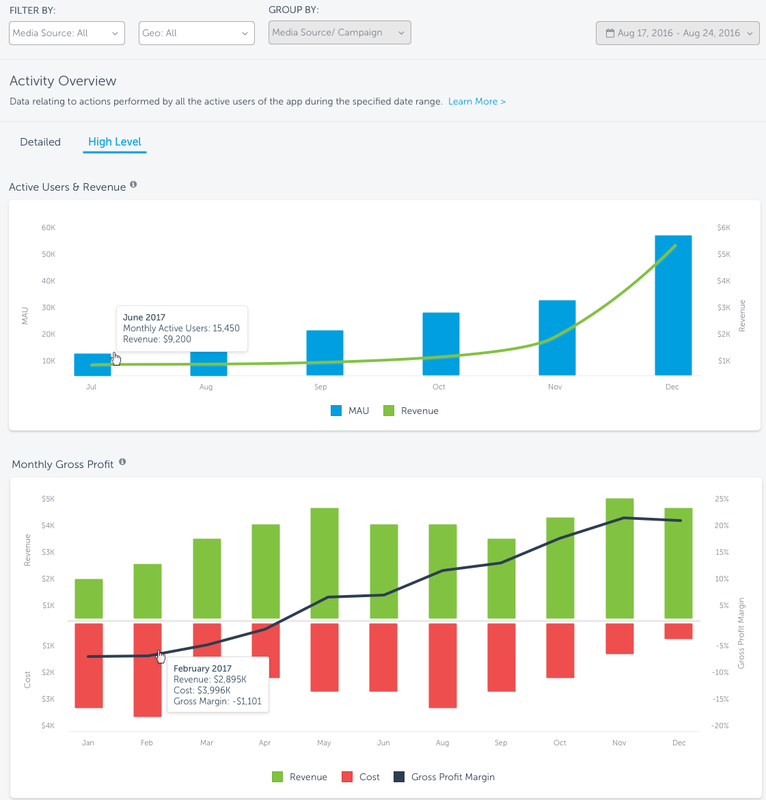 The Activity Report displays the app activity KPIs that occurred during a selected date range. In the Activity Report there is no dependency between the different KPIs being looked at, but purely the events that took place during the selected time frame. The KPI information is for organic and non-organic traffic together. (Daily Active Users) counts the unique users who performed an app session on a particular day, additional sessions performed on that day are not counted. When calculating the DAU value for a date range (i.e. for more than a single day) - the average value is displayed. Sunday - 10 daily active users, Mon - 12 daily active users, Tue - 8 daily active users, Avg DAU Sunday to Tue is (10 + 12 + 8) / 3 = an average of 10 daily active users. (Monthly Active Users) - There are two types of MAU calculation. On the Detailed tab in the dashboard, the MAU calculation is as follows: Every day we count the distinct number of users from the previous 30 days. On the High Level tab, we count the distinct number of users based on a specific calendar month. (Stickiness) a snapshot of retention. This KPI presents a view of the rate of your returning users. DAU/MAU rate of 50% would mean that the average user of your app is using it 15 out of 30 days that month. Total revenue for the selected date range - combined calculation of In-App Purchases (if reported by the application) and Ad Monetization revenue. Total sessions for the selected date range (if reported by the application). The number of installs within the selected date range. Displayed in graphical form. The default presentation shows DAU but you can also select MAU, DAU/MAU Rate, Revenue or Sessions. Activity data is available from the first date of the app definition on AppsFlyer or from January 2016. For the High Level dashboard, data is available from 1 July 2017 only. The available dimensions prior to 1 March 2017 are limited to GEO and Data only. Ad Monetization data is calculated once a day and is available a day later. Hence, the monetization data for a selected day will reflect the data of the day before for UTC and UTC- (minus), and two days before for UTC+ (plus) time zone. The data is aggregated on a daily basis. For users in time zone UTC- it may take up to 48 hours and for users in time zone UTC+ it may take up to 24 hours for the report to be populated with data. MAU data is supported based on UTC only. The data displayed in the Activity Summary table shows media sources with any kind of Activity sessions, including in-app events and installs. However, it is limited to the top 50 media sources, sorted by the number of sessions. To see all the data, you can use Master API or Pivot. Any Activity shown here is related to its primary attribution, i.e all retargeting activity is included but not presented separately. A user installs an app after clicking on a Network A’s ad. After a while, she sees a retargeting campaign ad for this app on Network B and clicks on it. Then she makes a purchase through this app. In case the purchase is made within Network B’s Re-engagement window, the purchase event would appear under Network B in the Activity report — because Network B gets primary attribution for this purchase. Activity dashboard doesn’t show uninstalls. The detailed analysis helps the advertiser understand trends and insights regarding the acquisition channels and its app status. Avg. MAU - the average number of monthly active users in the selected time range (each day holds the active uses in the previous 30 days). A trend chart displaying your most important metrics. For a detailed explanation of each Activity Metric, click here. The DAU/MAU rate is a ‘quality’ KPI. It indicates how many users have returned on a daily basis over the past month. You can also look at it as a ‘snapshot’ of retention. In the Activity Summary table you can see ALL data grouped by and filtered according to your selection. Click In-App Events to see the activity data for them. 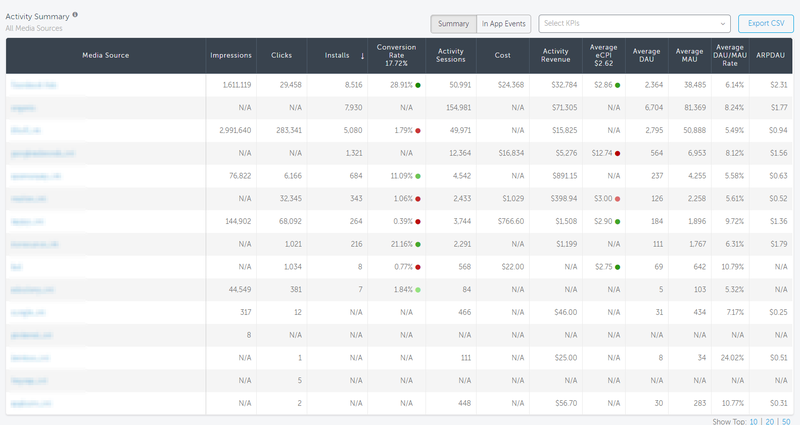 For each option, Summary or In-App Events, select the KPIs you want to view from the list. The table is also a good way to see how many of your DAU are new and how many are existing users (DAU minus Installs). A ‘bird’s eye view’ into the app and the success of marketing efforts. It’s an annual look back using a monthly time granularity. This graph displays the monthly active users and revenue for each month. This graph displays revenue vs. cost and the gross profit for each month.